Capitalism in Crisis: Richard Wolff Urges End to Austerity, New Jobs Program, Democratizing Work | Democracy Now! emeritus professor of economics at University of Massachusetts, Amherst, and visiting professor at New School University. He hosts a weekly program on WBAI 99.5-FM called Economic Update every Saturday at 12 p.m. ET. He is the author of several books, including, most recently, Democracy at Work: A Cure for Capitalism. Watch more interviews with Richard Wolff on Democracy Now! AMY GOODMAN: “Anda,” music by the pianist, arranger and composer Bebo Valdés. He died Friday at the age of 94. The son of a cigar factory worker and grandson of a slave, he studied classical music at the Conservatorio Municipal in Havana and became a favorite collaborator with the great Cuban singers of his era, including Beny Moré and Pío Leyva and Orlando Cascarita Guerra, along with Americans such as Woody Herman and Nat King Cole, was considered a giant during the golden age of Cuban music. This is Democracy Now!, democracynow.org, The War and Peace Report. Our guest is Richard Wolff, a professor emeritus at the University of Massachusetts, Amherst, now at New School University, author of a number of books, including Democracy at Work: A Cure for Capitalism. I want to talk about austerity here at home. This is House Speaker John Boehner speaking last month defending the $85 billion budget sequester cuts that took effect on March 1st. HOUSE SPEAKER JOHN BOEHNER: The American people know, the president gets more money, they’re just going to spend it. And the fact is, is that he’s gotten his tax hikes. It’s time to focus on the real problem here in Washington, and that is spending. AMY GOODMAN: House Speaker John Boehner. Professor Richard Wolff, your response? And also, that the Obama administration was warning catastrophe if sequestration took place. It took place. RICHARD WOLFF: Well, it’s a stunning comment on our dysfunctional government built on top of a dysfunctional economy. Here we are in the middle of a crisis. We have millions of people without work, millions of people losing their homes, an economy that doesn’t work for the vast majority. The United States government is one of the major customers for goods and services in America. Sequestration is simply a cutback in government spending. It doesn’t take rocket science to understand that if the government, as the largest single buyer of goods and services, cuts back on the goods and services it buys, that means companies across America will sell less, and they’ll have less need of workers, and they will lay off workers. So, this is an act that worsens an unemployment that is already severe. If you put that together with the tax increase on January 1st—and let me say a word about that. We heard a lot of public debate about taxing rich people, not taxing rich people, Republicans and Democrats, but the tax on the wealthy is small compared to the tax on the middle and lower incomes that went up on January 1st. When we raised the payroll tax here in America from 4.2 to 6.2 percent, we raised over $125 billion—huge amount of money, much more than was raised by taxing the rich—and we savaged the middle- and lower-income groups in America, those that in the presidential election both candidates had sworn to save and support. We attacked them, thereby limiting their capacity to buy goods and services because we taxed them more. You put together the taxing of the middle and lower incomes with the cutbacks of government spending, and you’re going to do what every European country that has imposed austerity has already discovered: You’re making the problem worse. So with all the homilies that Mr. Boehner can put out there about how spending is a problem, this abstract idea doesn’t change the fact you’re making the economic conditions of the mass of people worse by these austerity steps, not better. And that ought to be put as the fire burning at the feet of politicians, so they stop talking these abstractions and deal with the reality of what they’re doing. AMY GOODMAN: So what do you think needs to be done? RICHARD WOLFF: A radical change in the policies. And I think it has to go far beyond simply reversing this austerity program, which, again, just for a word about history, back in the 1930s, the last time we had a breakdown of our capitalist system like this, we didn’t have austerity, we didn’t have cutbacks. We had the opposite. Roosevelt, in the middle of the '30s, created the Social Security system, went to everybody over 65 and said, “I'm going to give you a check for the rest of your life.” He created the unemployment compensation system, giving all the unemployed for the first time checks every week for a year or two. And he created a public employment program and hired millions of workers. It’s the opposite of austerity. So any politician who says, “We must do this, because there’s no option,” has forgotten even the American history of not that long ago. So, the first thing I would do is go in that direction—not austerity, but its opposite. But I want to go further, because I think our problem is deeper. This crisis wasn’t supposed to happen. When it happened, it wasn’t supposed to last a long time. All of that has been proven false. The problems run deep. And I think what we have to do, and what that book tries to do, is to talk about reorganizing our economy so that for the first time we can say we’re not only going to get out of this crisis, we’re taking the kinds of steps that can prevent us from having them over and over again as our unstable business-cycle-ridden economy keeps imposing on us. So, for me, it’s the more profound change that we finally have to face, painful as it is. After 50 years of a country unwilling to face these questions, I think we need basic change. And that’s what I spend most of my time stressing. AMY GOODMAN: —what could Obama do without congressional support right now? RICHARD WOLFF: Well, I think, in many ways, he could initiate a public employment program. I think it’s long overdue that he find all the ways available to him to say what Roosevelt said—and not that Roosevelt did everything correctly, and not that he’s a genius or any of that, but to take some lessons from those people in our country before who took steps that were successful. AMY GOODMAN: I mean, Roosevelt didn’t plan on doing this when he first took office. RICHARD WOLFF: Absolutely. He had pressure from below. The CIO, the biggest union-organizing drive in American history, never had anything that successful before. AMY GOODMAN: As in AFL-CIO. RICHARD WOLFF: That’s right. And with the socialist and communist parties, who were strong at that time, working with them, they organized millions of Americans into unions who had never joined a union before, and they pushed from below in a very powerful way. And they changed Mr. Roosevelt, showing that politicians, if subject to pressure from below, can change—same lesson that Cyprus has just taught us yet again. So, my response is: Learn from that. Roosevelt went on the radio to the American people and said, basically, “If the private sector either cannot or will not provide work for the millions of Americans that need and want to work, then it’s my job as president to do it.” And he did it. And I think Mr. Obama could and should overcome whatever has made him hesitate. We in this country not only don’t have a federal employment program, the Republicans and Democrats haven’t even put it on the floor to debate it as an important issue, even though it comes out of our own history. So I would say, put us—put our people to work. They want to work. The Federal Reserve says 20 percent of our tools, equipment, factory and office space is sitting idle, unused. So we have the people who want to work; we have the tools, equipment and raw materials for them to work with. And lord knows we need the wealth they could produce. Put them to work, and make it a national issue that that happen. AMY GOODMAN: Where does the money come from? RICHARD WOLFF: Well, Roosevelt went to the wealthy, and he went to the corporations, and he said to them, “You must give me the money to take care of the mass of people, because if you don’t, we’re going to have a catastrophe in this country. We’re going to have a social revolution.” My argument is, let’s go back to the same tax rates that Roosevelt imposed, or at least in that neighborhood, which is much higher on wealthy people and much higher on corporations than we have today. That’s what he did. That’s how he funded it. And in case our politicians are worried, let’s remind them: Mr. Roosevelt, who took those daring steps, was re-elected to be president four consecutive times, the most popular president in American history. It’s not a dead-end political decision. It’s the best decision a president could make to leave his legacy in history, that, we are told, our presidents care so much about. AMY GOODMAN: We’re talking to Richard Wolff, author of Democracy at Work. Again, before we talk about “democracy at work,” I wanted to go to a recent hearing in Washington. Executives with the banking giant JPMorgan Chase appeared before a Senate panel earlier this month to answer questions around so-called “London Whale trades” that cost the bank more than $6 billion and derailed financial markets worldwide. This is Arizona Republican Senator John McCain criticizing JPMorgan’s actions. AMY GOODMAN: Ashley Bacon, JPMorgan’s interim chief risk officer, testified at the same hearing. ASHLEY BACON: I don’t think it is too big to fail. I think there’s further work that needs to be done to demonstrate and document that, and it’s in process. I’m not leading that process or deeply involved in it, but I think it is—it’s something that needs to be demonstrated to everybody’s satisfaction. AMY GOODMAN: That was Ashley Bacon, JPMorgan’s interim chief risk officer. Can you explain what took place here and what is happening? RICHARD WOLFF: Yes. On the question of “too big to fail,” there really isn’t much to say. In 2008, our banks failed—all of them—the way the Cyprus banks failed and for very similar reasons. They took in a lot of depositors’ money, and they made risky bets they shouldn’t have made, and they failed, and so they didn’t have the money to honor their obligations, and they turned to the government for a bailout. And when the government hesitated, because it’s public money to bail out a privately failed bank, they were told, in another kind of blackmail, “We’re too big to fail. If you don’t bail us out, we will collapse and take the entire economy with us.” And that was a persuasive argument. Particularly after they allowed Lehman Brothers to fail and that nearly did take the economy with it, that was a convincing argument. You would have thought they had then learned the lesson about the problem of a too-big-to-fail financial institution. If you thought that, you would have been wrong, because the same banks that were too big to fail in 2008 are, all of them, bigger today. So we didn’t learn the lesson. We didn’t break up the banks. We didn’t limit, control their growth. They’re bigger now than they were then. And in a sense, maybe shame on them the first time, but having allowed this to happen, it’s shame on us. Number two, we seem to need, as a nation, to believe that we have the power to control, limit or regulate, whether it’s the Glass-Steagall Act that came out of our disaster of the 1930s or the Dodd-Frank Act, which came out of the disaster that started in 2008. We seem to want to believe we can leave in place private banks, no matter how big they are, and hedge them about with regulations. The proof of the Whale trades in London, the proof of everything we know, is that these banks have the money, the staff, the resources to work their way around the regulations at least as fast as we impose them on them. That’s what these hearings fundamentally show. They can make trades that are too risky. They can lose wild amounts of money. They can turn to the government and demand to be helped and bailed out each time. And they get it. We are telling them, in a classic example, “Look, do whatever you want. You don’t have any risk of fundamental failure and punishment.” Regulation doesn’t work, because we believe in place an entity, a large corporation, with the money and the incentives to get around it. AMY GOODMAN: Interestingly, Jamie Dimon, the head of JPMorgan Chase, did not testify. He was brought before the Senate, what, about last June, where the senators were asking him for advice. And then, when you looked at the senators on the Senate committee and how much money JPMorgan Chase had given each of them, we’re talking about millions of dollars went to many of them. RICHARD WOLFF: When I say that the big corporations, particularly the banks, have the resources and the incentives, I’m being polite. Yeah, part of the resources are going into literally making sure that the political regulator is a good friend and understands the complexities. In simple English, they are buying their way into the situation we watch, which is: “We will pretend to be regretful. You will pretend to be protecting the public. You will make regulations that we help you write so that we can get around them.” It is something that ought not to be allowed to continue, because we’re living the economic crisis that comes from that way of doing business. AMY GOODMAN: What lessons have been learned since 2008? And today, could the U.S. see the same situation as Cyprus? RICHARD WOLFF: Absolutely. We have banks that are literally telling us, because we know from our controls that they are trying, even, to regenerate it. They’re trying to get people to borrow more money again. We’re not changing the wage structure of America, which means that Americans are required to go into debt to supplement their wages. You know, the irony is, we are trying, in the language of some of these folks, to kickstart our economy, to get it going again. But the problem is, our economy was a train heading into a stone wall in the first years of this century, and if we get our economy going again, without fundamental changes, what we’re doing is putting that same train back on the track heading towards the same wall. 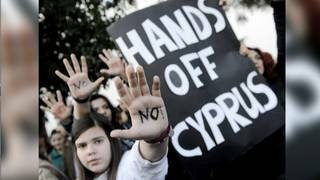 Cyprus shows us what’s happening. But we don’t have to take just small countries. Take Great Britain, our classic ally. Their economy is now in the second or, in some people’s minds, the third recession within the crisis since 2007. They are following an austerity problem—process exactly like that supported by Mr. Boehner, and the economic downturn in Great Britain is catastrophic for that society. And so, we have this image of a future for us, if we don’t make fundamental change, but everyone wants to put it away and pretend that we can let it go by itself or a few regulations will solve the problem. They haven’t. They’re not doing it now elsewhere. That’s not a strategy we should pursue in this country, either. AMY GOODMAN: When we come back, we’ll talk to Professor Richard Wolff about the alternatives, about, well, what he’s put forward, Democracy at Work: A Cure for Capitalism. This is Democracy Now! We’ll be back with Professor Wolff in a minute. AMY GOODMAN: We continue with Richard Wolff, professor emeritus of economics at University of Massachusetts, Amherst, visiting professor at New School University here in New York, does a weekly program on WBAI in New York called Economic Update every Saturday at noon. His latest book is Democracy at Work: A Cure for Capitalism. So what exactly do you mean by this? RICHARD WOLFF: What I mean is a change in the enterprises that produce the goods and services we all depend on and provide the jobs we all need and want. I think those have to be, in a fundamental way, democratized. So let me begin in that way. We live in a country that says it goes to war around the world to bring democracy and that its central, most important political value is democracy. If you believe that—and I am a fervent supporter of democracy, and obviously you are—you’ve named your program that way—then we ought to have democracy in the place where we as adults spend most of our time. Five out of seven days we go to work. We walk into a place where we use our brains and our muscles eight or more hours, five out of seven days. If democracy is an important value, it ought to be right there, first and foremost. But we don’t. We basically have a situation where, for most of us, we go to work in a place where the decisions that are made are made by a tiny group of people. The major shareholders who own the block of shares in our system select a board of directors, 15 to 20 people, and they make the basic decisions: what to produce, how to produce it, where to produce it, and what to do with the profits. The rest of us must live with the results of that decision. So if that tiny group of people make a decision to close the factory in Cincinnati or the office in Atlanta and move to Shanghai, the chips fall where they may. If they decide to use a toxic technology that’s not good for the air and water but is good for the profits, they do, we live with the results. And when they decide to take the profits of their business and to give enormous pay packages to a handful of top executives and big dividend payouts to their shareholders, which of course they do, since they’re in a position to do it, and the rest of us suddenly have to take out absurd debts to get our kids through college, then that’s the inequality of income and wealth that we have in America. So, I look at this decision-making apparatus, I say, “Why are we surprised that they make the decisions the way we do—they do?” We all live with the results, and we have no say in how those decisions are made. It’s not democratic. That’s the first thing. But the second thing is, we’re now in five years of economic crisis that indicate that way of organizing the decisions doesn’t work for the mass of people. It works for them. The stock market’s back. The profits of big corporations are back—surprise, surprise—given who makes the decisions. But we are left. And so, for me, the solution is, let’s face this. Let’s build an option, a real choice for Americans, between working in a non-democratic, top-down-organized capitalist enterprise or in what, for lack of a better term, we can call “cooperatives,” workplaces that are organized democratically. I think we’ll have less inequality of income, we will have less pollution of our environment, and we’ll have less loss of jobs out of the country, if those decisions were made by the people, as they should have been from the beginning, who will not make the kinds of decisions that got us into the mess of economic crisis that we’re in now. AMY GOODMAN: In June, you wrote a piece, Richard Wolff, in The Guardian called “Yes, There is an Alternative to Capitalism: Mondragon Shows the Way.” Mondragon, Spain’s renowned co-op where all enterprise is owned and directed by co-op members. At the Green Party’s convention last year, the keynote speaker, Gar Alperovitz, said the Mondragon model is being replicated here in the United States. I want to just turn to a clip of what Gar Alperovitz said, the professor of political economy at the University of Maryland. GAR ALPEROVITZ: So, in Ohio, the idea of worker ownership is a bigger idea. Lots of people understand it. And in Cleveland, building on the Mondragon model—some of you know about the Mondragon model—and other ideas, there are a series of worker-owned, integrated co-ops in Cleveland in a neighborhood where the average income is $18,000 per family. And they have got these co-ops, not just standing alone, but linked together with a nonprofit corporation and a revolving fund. The idea is to build the community and worker ownership, not just make a couple workers richer, to say the least, not rich, but to build a whole community, and to use the purchasing power of hospitals and universities—tax money in there—Medicare, Medicaid, education money, buy from these guys, and build the community. That model—and it’s the greenest for—one of the things is the greenest laundry in that part of the country, that uses about a third of the heat and about a third of the electricity and about a third of the water. They’re on track now to put in more solar capacity that exists—one of the other worker-owned companies—that exists in the entire state of Ohio. These are not little, dinky co-ops. AMY GOODMAN: That was Gar Alperovitz talking about the Mondragon model here. And when we were in Spain, Democracy Now! went to Mondragon and interviewed one of the cooperative members, and we’ll link to that at democracynow.org [ Click here to watch the interview with Mikel Lezamiz, director of Cooperative Dissemination at the Mondragon Cooperative Corporation in Spain’s Basque Country. ] But, Richard Wolff, talk about that model and what’s happening here. RICHARD WOLFF: Well, the model of Mondragon is so interesting, not only because it’s a real co-op, where the workers make the decisions—what to produce, how, where, what to do with the profits. And just to mention one of their achievements, they have a rule that the highest-paid worker cannot get more than a maximum of eight times the lowest. In our society, it’s typical in our large corporations that the CEO gets 300 to 400 times what the lowest worker. So, for those of us that are interested in a less unequal society than what we have here in America, the lesson is, if you cooperatize your enterprise, that’s a sure route to get there. And we haven’t found any other route that is just as effective. So, the importance of Mondragon is, they start in the middle of the 1950s with a Catholic priest, Father Arizmendi—I always have to remember it—with six workers in the north of Spain, desperately trying to overcome the unemployment there. And here we are over a half a century later. Having to compete with countless capitalist enterprises, they won that competition. Trying to grow, they have a growth record that would be the envy of any capitalist corporation. They went from six workers in 1956 to 120,000 workers today in Spain. AMY GOODMAN: And they are making? RICHARD WOLFF: And they are making everything. They make dishwashers. They make clothes washers. They raise rabbits on farms. They do high-tech research, together with General Motors and Microsoft as some of their partners there. They do an immense array. They’re really a family of 200 to 300 co-ops that are united within the Mondragon cooperative corporation. So they’ve shown the ability to grow. They’ve shown the ability to adapt. They’ve shown their competitive power. They have—excuse me, they’ve shown all the different ways that a corporation can develop without a top-down hierarchical, undemocratic structure. So we don’t have to choose between effectiveness, growth, job, security, and a cooperative structure. The cooperative structure can be a way to get there. Here in the United States, we have lots of such co-ops developing. There’s one even named after Father Arizmendi in California in the Bay Area. There are six Arizmendi bakeries and coffee shops that were set up on that model. They started with one; they’re now six. Hint: They’ve grown. And you can do this. And all over the United States, there are these efforts, often done by people who want a different kind of life. They want to be in charge of their own job. They want to have a sense of control and a sense that they’re not just a drone doing the work, but they’re part of the folks who design and direct. It brings out new capacities. It makes you more happier to go to work. It’s a more satisfying job life than you would otherwise have. So I think it recommends itself on all kinds of levels. One other example, we can learn something from a country called Italy that we admire for its cuisine and its lovely countryside. They have a law there, passed in 1985, called the Marcora Law after the name of the legislator. Here’s what it does. It offers a choice to unemployed workers. You can take a dole every week, an unemployment check, the way we do in this country, or you have an option, an option B that we don’t have. If you get at least nine other workers to make the—unemployed workers, like yourself, to make the following choice, here’s what you can get. As a lump sum, you can get your entire unemployment program of two years of checks in your hands right at the beginning; you have to have nine other workers or more, and you have to use that money as the start-up capital for a cooperative enterprise. The idea of the Italian government was, if we give workers this to set up a job and an enterprise, they will be much more committed to it than they would if they didn’t have that role. AMY GOODMAN: How do they know they’ll do it? RICHARD WOLFF: They don’t. But they know those workers have an incentive, because if they don’t make that work, they can’t go back and collect unemployment. That’s what they got. The government doesn’t spend much more money than it would have anyway, but it creates jobs, and it creates workers committed, because it’s their enterprise, to make that work as their personal solution and as a way not only for them to survive, but for the whole of the Italian society for the first time to see what it’s like to have an enterprise where you run the affair. You know, here in America, we want to believe in freedom of choice. Let’s give our people freedom of choice. They can have the choice to go work in a top-down, capitalist enterprise—what we’re used to—but if we develop the alternative, really a program of co-ops around the country, then American young people and older people could say, “What would it be like to work there? Let’s see what that’s like.” And then we would have the choice we do not have in this country now. RICHARD WOLFF: You know, he gets away with saying things which no undergraduate in the United States with a responsible economic professor could ever get away with. If you want to refer to things as nanny states, then the place you go in Europe is not the southern tier—Portugal, Spain and Italy; the place you go are Germany and Scandinavia, because they provide more social services to their people than anybody else. And guess what: Not only are they not in trouble economically, they are the winners of the current situation. The unemployment rate in Germany is now below 5 percent. Ours is pushing between 7 and 8 percent. So, please, get your facts right, Mr. O’Reilly. The nanny state, you call it, the program of countries like Germany and Scandinavia, who tax their people heavily, by all means, but who provide them with social services that would be the envy of the United States—a national health program that takes care of you, whether you’re employed or not, and gives you proper healthcare. In France, for example, the law says when you go to work, you get five weeks’ paid vacation. That’s not an option; that’s the law. You get support when you’re a new parent for your child care and so forth. They provide services. And they are successful in Germany and Scandinavia, much more than we are in the United States and much more than those countries in the south. AMY GOODMAN: In our last minute, other cures for capitalism, as you put it? RICHARD WOLFF: —in the private hands of banks. Either we don’t become a debt-ridden country, or we make borrowing and lending a social program. We can’t allow private banking. It doesn’t work. It needs to be changed. AMY GOODMAN: Richard Wolff, I want to thank you for being with us. If you’d like a copy of today’s show, you can go to our website at democracynow.org. Richard Wolff is professor emeritus at University of Massachusetts, teaches at New School University.